William Boyd, whose James Bond continuation novel is set to be one of this year’s publishing highlights, has today announced that his book will be called Solo. The announcement came on the opening day of The London Book Fair, where Boyd is Author of the Day. ‘Sometimes less is more. For me as a novelist the simple beauty of Solo as the title of the next James Bond novel is that this short four-letter word is particularly and strikingly apt for the novel I have written. In my novel, events conspire to make Bond go off on a self-appointed mission of his own, unannounced and without any authorization - and he’s fully prepared to take the consequences of his audacity. ‘The journey Bond goes on takes in three continents – with the main focus honing in on Africa. It’s what happens to Bond in Africa that generates his urge to “go solo” and take matters into his own hands in the USA. Very little else has been revealed about the book at this stage, other than that it will feature a veteran secret agent, with Bond aged 45. It will be published on 26 September in the UK by Fleming’s original publisher, Jonathan Cape, an imprint of Vintage Publishing, part of The Random House Group, in hardback, ebook and audio editions. HarperCollins will publish the book in Canada and the U.S. on 8 October. Solo... I think I love it. Not an obvious Bond title, but still very Bondian. Elegant, but also tough. And I love one word titles. We haven't had a one word title on an adult Bond novel since Doubleshot in 2000. Too much to hope for a Man From U.N.C.L.E. crossover? Don't forget who came up with the name Napoleon Solo. i think it's a cool title. 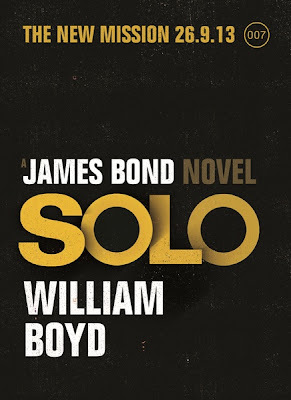 my first reaction was to think back over Fleming's contribution to UNCLE and his own use of the name Solo in a novel...but then the graphic potential of the single word really struck me. great!